The nationwide survey found voters split at 47 percent when asked if they approved or disapproved of the job Trump is doing as president. April was the last time Trump had a positive net approval rating, according to Morning Consult/Politico polling. As a scandal regarding abuse allegations against a top White House aide emerged, voters were evenly split on whether they approved of President Donald Trump’s job performance, marking the first time in nine months that his net approval wasn’t in negative territory. 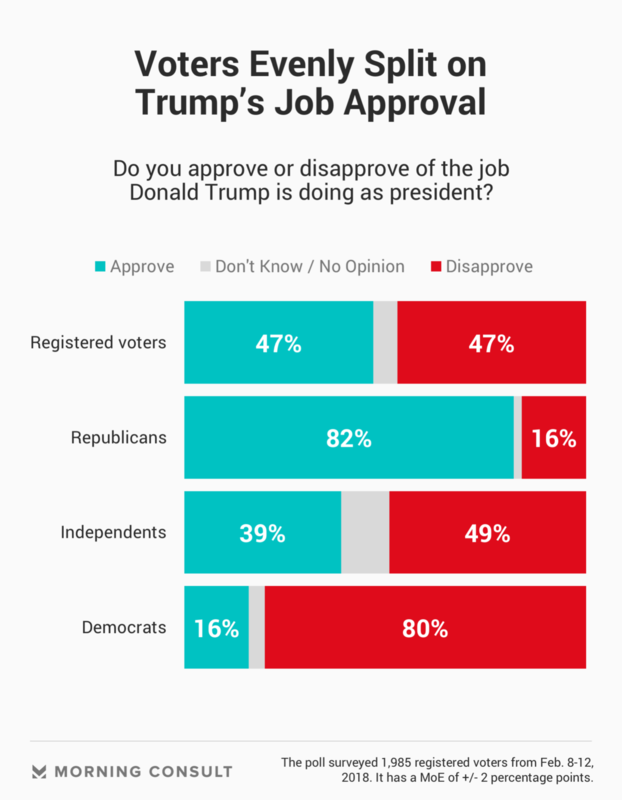 According to a new Morning Consult/Politico poll, voters are split, 47 percent to 47 percent, when asked if they approve or disapprove of the job Trump is doing as president. Six percent said they did not know or had no opinion. The poll of 1,985 registered voters, conducted Feb. 8-12, has a margin of error of plus or minus 2 percentage points. “The economy is going to play a big role in everything that matters this year,” said Bryan Lanza, managing director at Mercury LLC and the former communications director for Trump’s presidential transition team, in a Monday phone interview. Lanza pointed specifically to the tax bill Trump signed into law in December. Trump’s approval hit 47 percent in a Jan. 30-Feb. 1 survey, but net approval remained underwater, with 49 percent of voters disapproving. In the latest weekly poll, the percentage of people who said they disapproved of Trump was down to 47 percent, putting Trump’s net approval at zero. The last time Morning Consult/Politico polling found Trump without a negative approval rating was in a survey conducted April 27-30. At the time, 48 percent of voters approved of his job performance while 45 percent disapproved. Trump’s net approval reached a low point in an Aug. 17-19 poll, during which 39 percent approved of his job performance and 56 percent disapproved. The latest survey came as the White House battled a stretch of media attention regarding Rob Porter, who resigned his post as White House staff secretary Feb. 7 after news reports revealed allegations of domestic verbal and physical abuse — a scandal that prompted questions about the handling of the situation by senior administration officials, most notably White House chief of staff John Kelly. The White House did not respond to a request for comment about its handling of the Porter situation. The most recent poll found that a plurality of voters – 42 percent – did not know or had no opinion when asked if they approved of the way the Trump administration handled the allegations against Porter, while 33 percent strongly or somewhat approved and 25 percent strongly or somewhat disapproved. Doug Thornell, managing director at SKDKnickerbocker and a Democratic strategist, attributed the uptick in Trump’s approval to residual effects of his Jan. 30 State of the Union address and the tax bill. In a Tuesday phone interview, Thornell said the controversies of the moment involving the White House are not fully registering with voters. “The events in Washington are moving at light speed, and when you’re at home and taking care of your family and thinking about your job and retirement, everything going on here is not something you’re really factoring in,” he said. Correction: A previous version of this story overstated the percentage of voters who disapproved of the way the Trump administration handled the allegations against Porter.